Dr. Segelnick has been practicing in Brooklyn for over 20 years. After attending Brooklyn College, Dr. Segelnick completed his dental degree at the prestigious and top ranked State University of New York at Buffalo Dental School with a Minor in Periodontology. He went on to complete his specialty training in Periodontology at Temple University School of Dentistry in Philadelphia, where he learned to be proficient in Implant dentistry. Dr. Segelnick has also completed a Master of Science degree in Forensic Examination from Touro College, School of Health Sciences. Dr. Segelnick loves teaching and helping future dentists and periodontists. 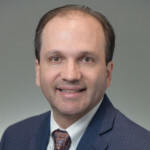 He currently holds positions as: Adjunct Clinical Professor at New York University College of Dentistry, in the Department of Periodontology and Implant Dentistry. Dr. Segelnick teaches in the post graduate Advanced Education Program in Periodontics. He is also the Division Chief of Periodontics at Brookdale University Hospital and Medical Center. At Brookdale he teaches periodontology to residents in the General Practice Residency program. Dr. Segelnick is also an Attending at New York – Presbyterian/Queens Hospital. Dr. Segelnick is board certified in both Periodontology and Dental Implant Surgery. Dr. Katherine Mantzikos, DMD has worked with Dr. Segelnick since 2002. Like Dr. Segelnick, Dr. Mantzikos is a Diplomate of the American Board of Periodontology and her practice is limited to periodontics and the placement of dental implants. Dr. Mantzikos earned her degree, Doctor of Dental Medicine, from Tufts University School of Dental Medicine in Boston, Massachusetts. Upon graduation, she returned to her home state of New York, to complete two years of General Practice Residency and Oral Medicine at New York Hospital of Queens, where she served as the Chief Resident. Dr. Mantzikos’ Advanced Education in Periodontics and Implant Dentistry was at New York University’s College of Dentistry. Dr. Katherine Mantzikos is a member of numerous dental organizations, some of which include the Second District Dental Society, New York State Dental Association, Northeastern Society of Periodontists and American Academy of Periodontology. Dr. Mantzikos is board certified in both Periodontology and Dental Implant Surgery. Dr. Mantzikos is also a clinical consultant for The Dental Advisor. Call us and a friendly associate will be happy to connect you with the proper medical care for your oral needs.